The 2000B/I Age Verifier consists of the DS6608-SR20007 (Black)Digital Scanner and the Windows®-Based PCAV.exe - Age Verification Software. This system provides a versatile means of checking IDs before selling age-restricted products, and reading Point of Sale - UPC barcodes as well as other 1D & 2D barcodes, with the speed and cost of a linear scanner. Current and future retail and commercial applications will involve much more than linear bar codes. EAN-UCC composite and RSS bar codes are beginning to appear in retail markets, while PDF417 bar codes are used for age verification in age-restricted item sales & inventory applications. The omni-directional reading capability of the 2000B/I allows fast reading of all of these bar codes. 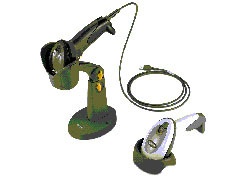 Simply point and squeeze scanner trigger. No need to move scanner or wait for raster beam. Easy to use PCAV Windows®-Based Software that accepts dataContained on Driver's Licenses and ID cards that follow AAMVA published Standards and many other States's Driver's Licenses that do not follow the Standards. This data is then processed to perform a number of actions discussed in detail in our User's Guide. The SYM-DS6608 Digital Scanner with RS232 DB9F Sub cable, and external power supply. The DS6608 captures the PDF-417 2D bar code data and transmits it to the PC. Our Age Verification Software will perform its function, when a driver's license or ID is read, or transmit standard barcode data to your other applications. This Device is discussed in our PC-Based Driver's License/ID Card Reader System User's Guide. The PC AV Age Verification Software Program is automatically loaded when the PC is powered ON. It remains resident and is activated when it receives data from the scanner. If the data is not recognized as a driver's license, it is passed on to the PCs currently running application as though it had been entered via the keyboard. When the program detects the data representing a PDF-417 encoded driver's license, it performs the three steps listed below. The data received from the scanner is transmitted to the PCs serial port, or, if preferred, to a USB port. It reads the Birth Date and Expiration Date encoded on a driver's license and compares the data to the PC clock settings. It controls the display to indicate the Age and License validity. A record of Driver's Licenses or IDs read can be created and saved in a database.txt file or Excel file. The first file that can be created is an edited record file. The second captures a complete record of all card read, including duplicate records. The third is a CSV File that can be used for multiple purposes. These files and their use are covered in complete detail in the User's Guide. 26886 / Port Authority USB-Serial DB9 Adapter. Ambient Light Immunity: Immune to direct exposure of normal office and factory lighting conditions, as well as direct exposure to sunlight. 2000B/I-S-X (X=COLOR) Hands-Free Intellistand: 20-66483-01 - Cash Register White or 20-66483-02, Twilight Black.